Thomas was born in Kersey in 1885. By 1911 he is living at 33 Angel Street, Hadleigh with his wife, Alice and their children; George William (4), Alice Lilian (2) and 3 month old Thomas Harold. They were also living with Alice's 70 year old father, William Hynard, who was by then an Army Pensioner. Thomas was employed as a farm labourer. We are not exactly sure when he enlisted into the army, but it seems like many other young men from Hadleigh, William joined the local territorial battalion, the 5th Battalion the Suffolk Regiment. If we assume that William had joined the battalion before war broke out then we know that he would have been mobilised on the night of the 4th/5th August 1914. The whereabouts of Private Thomas Frost 's Medals are not known, however, the medal index card above states that he was entitled to the above three medals. For the families of the men who were initially reported as missing, there was a long and painful wait for news. 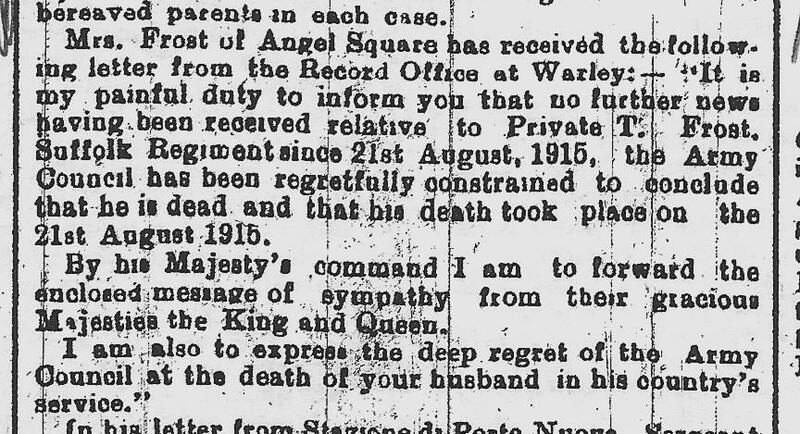 After repeated requests for information the wife of Thomas Frost received a letter from an officer stating “I very much regret to inform you that your husband was posted as missing after the action which we took part in on August 12th. I do not know what to assume regards the missing on this occasion. ‘A’ Company had one of the worst parts to cross and I fear suffered heavily, and as we have never been able to go near the locality we passed that night, it has been impossible to get any reliable information. Names of our men held as prisoners in Turkey are still coming through and so one cannot give up all hope.” Some never gave up hope, but eventually, they had to accept that their loved ones were dead. The wife of Thomas Frost had to wait over two years before they received official confirmation, after which a short notice was published in the Suffolk Free Press in November 1917. We hope that this page has been able to tell the story of Thomas Frost. If you know of any information which might help to add to the story then please get in touch.